Hi there! I’m Jane Bell Lassiter and I’m glad you stopped by! I’m an artist, an instructor, a facilitator, and a project manager for the federal government. 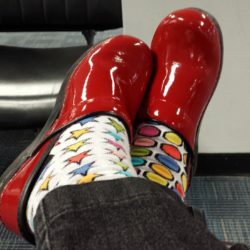 I’m a wife, a daughter, an aunt, a friend and a proud Army “brat” that loves to wear colorful clogs with mismatched socks. I launched Jane Bell Designs in 2013 when I began selling my artwork online and exhibiting at art festivals from Raleigh, NC to Atlanta, GA. I love, love, love color and texture in my artwork and infuse good vibes into every piece. My wish for my artwork is to spread happiness, foster curiosity, and even… just maybe, inspire others to pick up a paintbrush. I have always been a creative soul. At a young age, I remember being inspired by pop artist Peter Max – his artwork was filled with bright colors, fantasy and whimsy. In 2016, I was thrilled to meet him and purchase an original piece of his art. 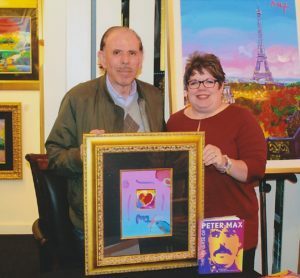 Meeting Peter Max… dream come true! I continued my love of art traveling across the United States and Europe moving frequently due to my Dad’s military career. Prior to moving to Virginia, I lived and worked in Chicago, where I spent hours wandering through the Art Institute of Chicago studying the works of Picasso, Monet, Van Gough, Chagall, and others. Now, I can pop into the National Gallery of Art during my lunch breaks whenever I want! My artwork ranges from nonrepresentational abstracts filled with meaning and intention based on my life experiences to bright, happy, colorful pop art. 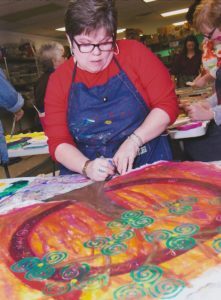 I balance my “day job” with my creative passions – painting, teaching in-home and on-site painting classes/workshops in the USA – #havepaintwilltravel. I believe everyone has an “inner artist” and simply needs an introduction to what is in their soul… and I’m on a mission to dispel the “I’m not creative!” myth, one person at a time! In my spare time, I enjoy reading, travel, wine, and Minions make me giggle. Now, please grab a cup of tea (or something equally as delicious) and have a look around my site!